Singing all of her life, Julie Moss excels at old-time gospel and classic country music, but her musical talents seem to know no bounds. She has honed her skills at yodeling and now includes that in her programs as well. Moss has become a popular performer at community events throughout Iowa, and her schedule fills up fast these days. She’s performed more than 1,000 shows in the past decade for both public and private audiences and has a special connection with seniors. Julie was born and raised in central Iowa and lives just a few miles from where she grew up near Elkhart. After 20+ years away from entertaining, she began singing for audiences again when her Grandmother moved to her hometown in the late 90′s and it regenerated her love of music. She learned how to play the guitar to accompany herself and the rest is history. She now sings daily around town and loves it. Julie joined Merrymakers in the fall of 2008 and has enjoyed meeting and singing for her MM audiences. She has an infectious smile and you can’t help but smile back. Her strong vocals are laced with country and you’ll hear a slight accent, which she says is from growing up on the “south side” of town. 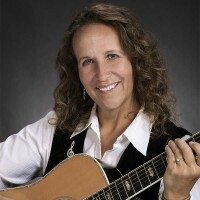 In late December of 2009, Julie finished recording a country / bluegrass gospel album with musician Tim Crouch from Arkansas. It has 12 old-time favorites and includes one yodeling tune. You can listen to the songs and find out more on her website.